One can live a linear life propelled forward from point A to point B with a direct and simple trajectory. A life like this is occasionally stellar, arching across the sky like Haley’s Comet. It can also be a simple life, basic, dependable and accommodating and without much risk. The linear life is the vanilla ice cream equivalent. And I like vanilla ice cream, but I rarely eat JUST vanilla ice cream. Most of us embellish vanilla ice cream; we add caramel or jimmies or Shell or nuts. Better yet, we add vanilla ice cream to apple pie or a warm brownie or pineapple bread pudding. It is not that vanilla ice cream is unacceptable or unpalatable; it is that it can be better with accompaniment. Also, how often is life linear? Never in the history of the universe has a flawless, cut diamond been discovered in the wild. Diamonds are found in the rough. It is only after they are cut and polished are their flaws detectable. 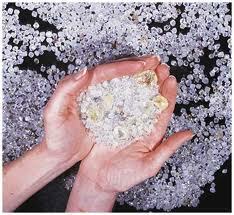 And the most brilliant diamonds have so many facets, cuts made into the rough stone to add light and sparkle. 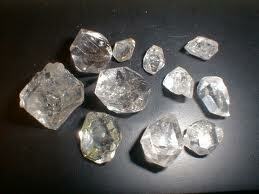 The depth and complexity by which a stone can be cut is what determines the diamond’s brilliance. If a stone is flawed, it can be that one additional cut, made in an attempt to give one more facet, that cracks the stone and renders it worthless. Is it stilla diamond? Absolutely. Could it be placed in a setting and sold? Not likely. And for those who listen to that voice, they miss out of something truly stunning. And it is their own pure pleasure at twirling in the light and radiating heat. Indeed, the precision cut stone has clarity and brilliance that is undeniable. And the sparkle is difficult to ignore. Who isn’t stunned and captivated by the light emitted from the interior of a beautiful diamond? We are all rough cut stones, found in the wild. We all have varying weight and potential. But oh, the amazement to release the crystalline brilliance by living a life that facets us into a complex and stunning stone. It is the Creator who makes the rough stone, giving it the inherent, innate ability to one day become something grand. It is by our choices, actions, failures, mistakes and catastrophes that we facet our lives. It is through our free will that we discover that which we had all along, hidden inside of us, inside the roughness. It is through our own force and actions we create something truly brilliant.